It's Christmas at my house today! 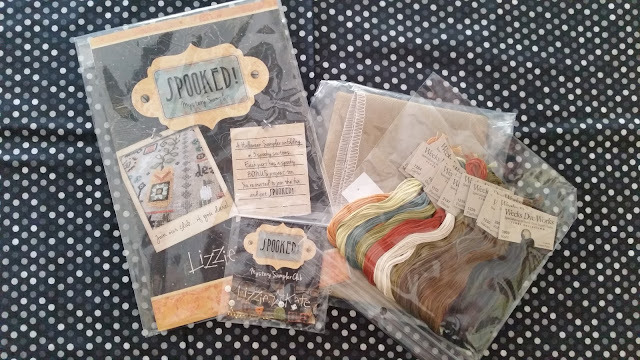 I have been anxiously awaiting my LK mystery sampler in the mail each day. 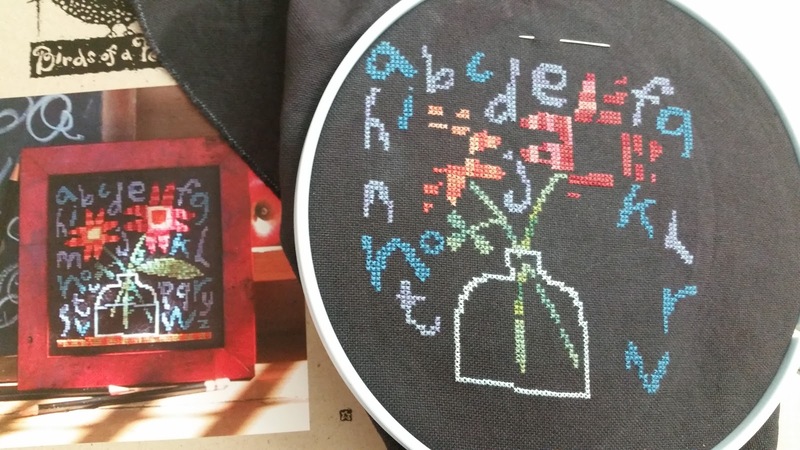 A stitcher posted her start of it on a Facebook group today and I almost couldn't stand it! I have been reluctantly stitching on other stuff while waiting for it to arrive. I've worked mostly on BOF Schoolhouse Sampler above, filling in the flower petals. Still loving the colors against the dark fabric. This week is also finals week for me in two online college courses I am taking. I mistakenly thought a course in Children's Literature would be easy, there is FIVE essays due for the final! So my weekend will be spent mostly with my nose in a textbook with hourly trips to check the mailbox. And here is an Ebay purchase (that ahem still got here faster than my mystery sampler). 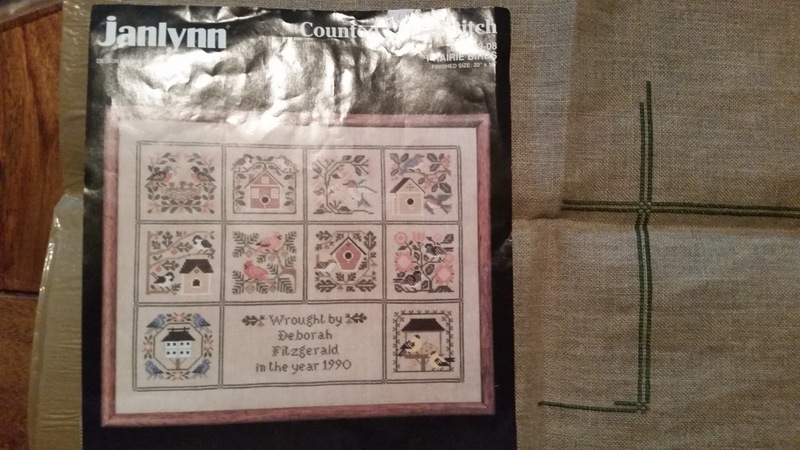 I already have this pattern in the form of a Prairie School booklet, but was surprised to find it in kit form. This is a Janlynn kit from 1989! I was also surprised to find it came with a nice evenweave fabric, I thought most kits of that era had only Aida cloth with them. I admit I have an odd habit of searching for half finished cross stitch on Ebay because I don't have enough of my own at home apparently. Maybe I just hate to see someone else's craft go unfinished and unloved. 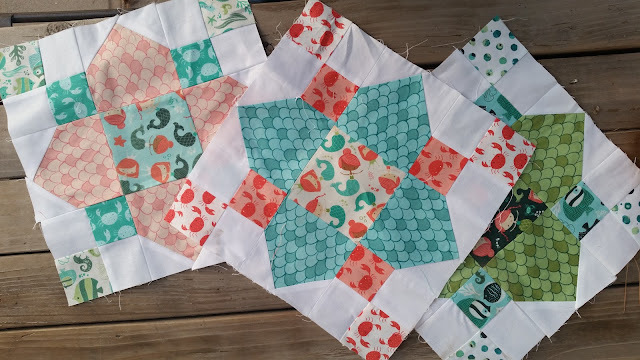 Here is my summertime quilt project. I forget the name of the fabric now, but isn't it sooooo cute!?!? I love mermaids and couldn't resist this. I actually got the inspiration for this project from another blogger Seaside Stitches. She did hers in bright Keith Fassett florals, and when I originally went searching for fabric I intended to do something similiar (hers are gorgeous!). I had never tried this block but she linked to an easy enough you-tube tutorial for it and well it just called to me. So I have my blocks all done for it (about 25 blocks or a lap-size quilt) just need to get them squared and sewn together. And lastly the latest harvest from our summer garden Pumpkins! 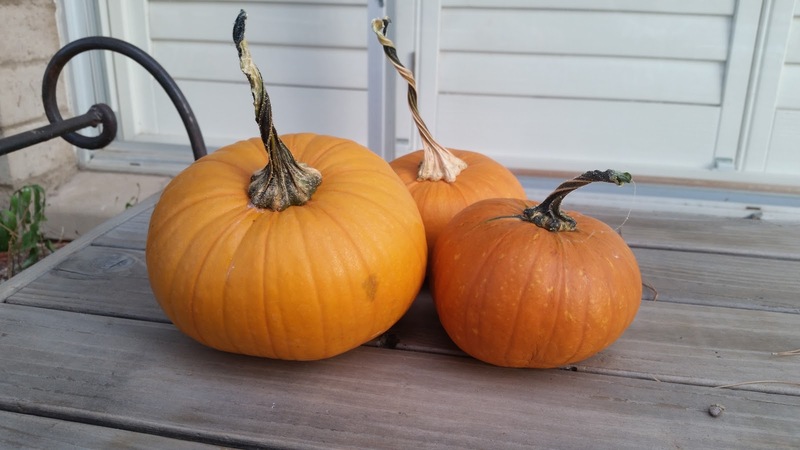 No, we didn't actually plant these, we compost year round and so the seeds must have been in the compost soil we used and just sprouted on their own. So this year we will be the weird family on our block with 4th of July Jack o'Lanterns. This is my summertime stitch this month. At least until the new LK mystery sampler comes out in 2 days...so excited for that! 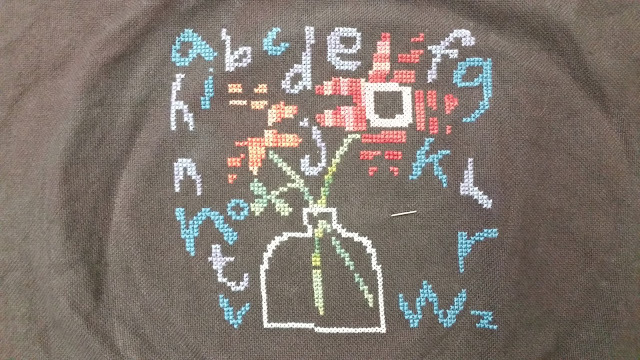 Anyway back to my current stitch, it's a Birds of A Feather chart "Schoolhouse Sampler" I love the striped petals against the black fabric. And I have a funny story to go along with the fabric. I dye a lot of my stitching fabric myself in a large stainless steel soup pot I reserve just for that chore. The pot is heavy though when it is filled with dye, fabric, and water. So when I went to dump it in the kitchen sink I accidentally tipped it towards me, and spilled it all over myself and the kitchen counters. Well it was hot black water, and so I immediately took off my pants and am in the kitchen scrubbing trying to scrub the black off of our white cabinets when my husband came in on the other side of our counter. I started to tell him I had had an accident, and then he came around the counter and saw the dye all over the floor and started laughing. He apparently thought I had had some other kind of unfortunate accident (i'm really not that old yet!) Luckily the cabinets should be easy enough to paint over, and it didn't soak into the tile. My pants were pretty much done for though. 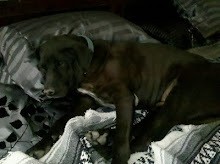 Here is my summertime visitor. 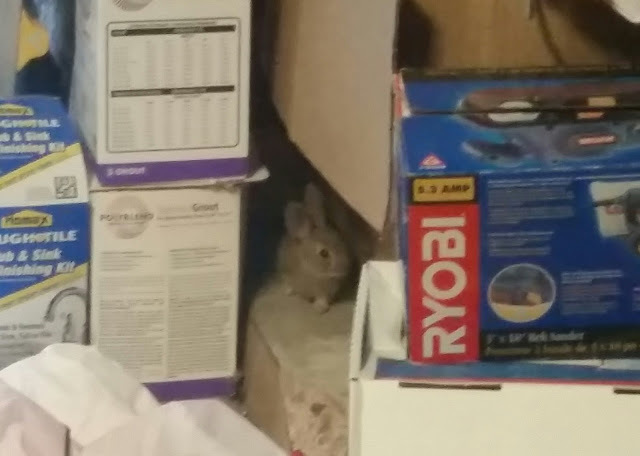 I get home in the wee hours of the morning from work, and I pulled into our garage and saw/heard something dart under my husband's workbench in the garage. Well Phoenix is notorious for large roof rats that love our citrus trees and swimming pools. I have never seen one but picture them as huge rats with sharp teeth. So there was much screaming in our garage when I though I was locked in there with one of them. Instead I found this cute little baby bunny huddled inside. He must have darted in as I pulled the car into the garage, he was barely bigger than my hand...sooo cute! And here is my summer garden. We have our vegetable garden in full swing already, you have to plant early in the spring here as temps get to 120 degrees in the summer and scorch everything. But this year my husband added a side bed to our raised garden bed for these beauties. 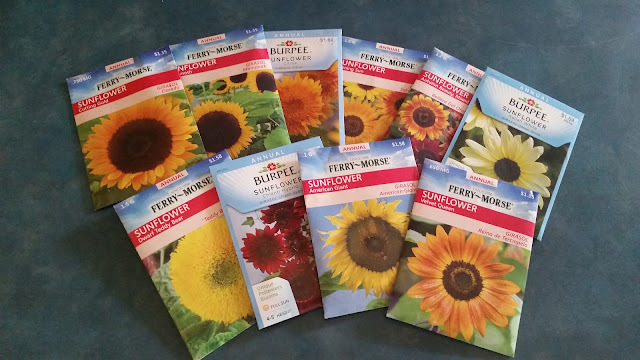 I love sunflowers and they seem to do well here in our summer heat. I picked a bunch of different colors and heights so hopefully the bed will fill in nicely.